For a clear view to the outside both sides of the outer tent can be rolled up. Both sides of the rainfly can be rolled up and secured on hot summer nights or for stargazing. Should the weather change, just roll back down and close the buckles. 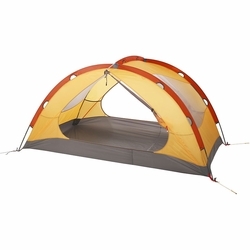 The rolled-up outdoor tent is attached with the Exped Grab Hooks. A reinforcement protects the pole channel. In case of rain, the outer tent is easily tensioned over the inner tent thanks to the colored buckles. Colored zippers, which are also reflective and luminous at night. Mesh side pockets keep order in the tent. Accessory organizer. Poles, pegs, and repair kit are stowed in separate compartments. In the Packsack outer and inner tent can be packed separately.